It seems that on iPad, iBooks, Kindle, or Kobo won't show any user highlightings? For example, just go to https://developer.apple.com/library/mac/#documentation/Cocoa/Conceptual/ObjectiveC/Introduction/introObjectiveC.html and you will see at the top right corner to download the PDF file. 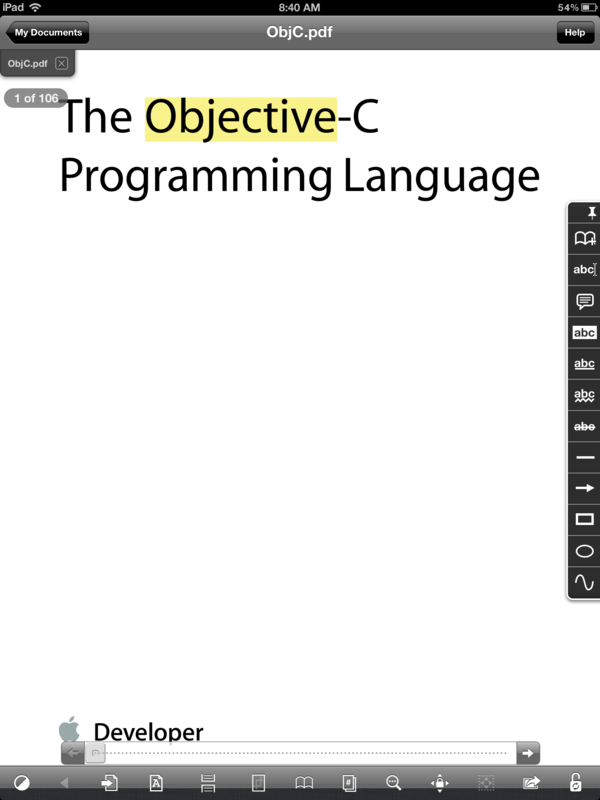 Right click and save it into your Mac or PC, and use Acrobat 10 or Mac's Preview to highlight the word "Objective-C" on the frontpage of the file. We can close and re-open the file to see the highlighting. Now use DropBox or Box.net and transfer the file to iPad's iBooks (I am using the New iPad (3rd Gen)). (Done by downloading the file and "Open With" iBooks). The highlighting won't show up at all. This is a simple test... the other document which I highlighted for many pages also won't show any highlighting either. I tried also the Kindle app and Kobo app on iPad and they won't show the highlighting either. iBooks for iPad currently doesn't support highlighting in PDFs. However, there are many 3rd party apps like iAnnotate PDF, GoodReader, or PDFpen that support PDF highlighting and annotating. I use GoodReader and I can personally verify that PDF highlights that were made on Mac's Preview do show up on the GoodReader iPad app. I also tested the DropBox iPad app and PDF highlights do not show up. Hopefully, Apple will add PDF highlighting to a future version of iBooks. If enough people request this feature at the Apple feedback site, maybe they will add it in the near future. PDF reader gives highlighting but (1)in iBooks we can get the meaning for the hard words. (2)pages are separate and gives a pleasant experience. I request the apple to provide highlight in iBooks. If you can download the file as an .epub then it shows you your highlighting. Not the answer you're looking for? Browse other questions tagged ipad pdf books kindle . Is it possible to search within a PDF document using Kindle for iPad? How do I create a link on the iPad home screen to a specific pdf? iBooks: how to sync PDF only?